M.R. James, who was a Cambridge professor, biblical scholar, antiquarian, and historian, had his own tradition of reading his latest story aloud to friends or students on Christmas Eve. Many of his best ghost stories involve scholarly men like himself who accidentally stumble across some inexplicable horror–some, like the museum curator in The Mezzotint are merely witnesses and survive their brush with the supernatural while others, like poor Mr. Wraxall in Count Magnus, are not so fortunate. The first of these I’m going to look at is one of my favorites, Oh, Whistle, and I’ll Come to You, My Lad. It’s on the Gaslight site at http://gaslight.mtroyal.ab.ca/jamesX08.htm. This story has been adapted twice by the BBC, once in 1968 for the show that led to A Ghost Story for Christmas and again in 2010. Both versions dropped the “Oh” and “My Lad” from the beginning and end of the original title (which, by the way, is a quotation from a song by Robert Burns). Aside from a few flaws, the 1968 black-and-white version is effectively done. In a nice touch, this version begins with two hotel maids putting sheets on the spare bed before the new guest arrives. 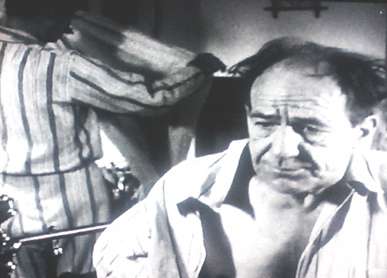 Michael Hordern plays the pedantic and absent-minded Professor Parkins. My main complaint with this version is that Parkins constantly mumbles and hums to himself, and sometimes isn’t even coherent on those occasions when he speaks to other people. His “hems” and “haws” are supposed to be comedic indications of his absent-mindedness, but it gets annoying very quickly. The professor seems isolated from those around him. He doesn’t speak to the other hotel guests, apart from the colonel who has the only other significant role in the story. In the dining-room, Parkins sits by himself at a small table while the colonel and others sit together at a large table. Parkins rejects the colonel’s offer to play golf with him and instead spends his vacation walking alone on empty beaches and through the woods (which is actually my idea of a nice vacation, aside from the ghost that’s about to appear). 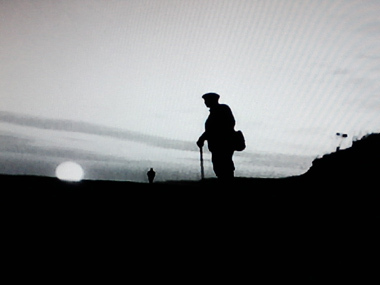 He finds the whistle in an old churchyard–one of those places you can still see along the English coast that are slowly falling into the sea as erosion eats away at the shoreline. It’s not as old as a Templar site, which would have been abandoned by 1200; going by the dates on the gravestones, the church was in use as recently as 1700. At the edge of the cliff is one gravestone about to topple over. Presumably, the grave beneath has already been exposed and is falling away piece by piece. 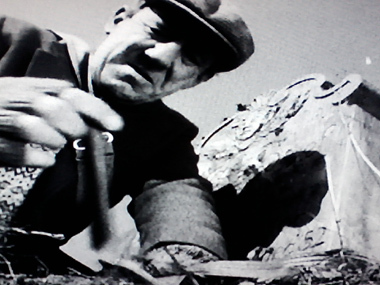 It isn’t shown clearly, but it looks as if Parkins discovers the whistle inside this grave; he mutters something about “bones” as he reaches over the cliff’s edge to retrieve it. From this point, the BBC version follows James’s story fairly faithfully. Even before he blows into the whistle, Parkins spots an indistinct figure some distance up the beach as he heads back to the inn. Parkins’s response to his own translation of this question is “We shall blow it and see.” Then he does. 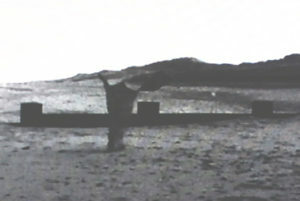 With the high-pitched note of the whistle, the image of a figure on a desolate beach immediately appears in his mind and a burst of wind comes up around the inn. The wind continues to blow all that night. That night whenever he closes his eyes to try and sleep, Parkins sees repeated images of a terrified man being pursued up a beach by an indistinct figure. This sequence is in the short story, but made more immediate here by having the pursued person be Parkins rather than an anonymous man. It’s also heightened by abruptly cutting from the scenes on the beach to close-ups of Parkins’s eyes opening as he lies awake in the dark. 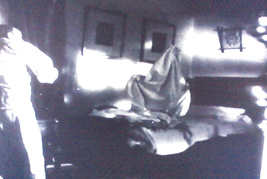 The figure pursuing him is only glimpsed at the end when it catches up with him, but it doesn’t appear to be a man dressed up in sheets, like the simplest of Halloween costumes; it looks more like draperies suspended kite-like on a frame and moving by stop-motion animation, an effect which makes it creepily unreal and inhuman in both form and movement. Parkins gives up on sleeping and turns on the light over his bed. We hear some rustling of bedclothes from the dark end of the room, but nothing further occurs that night. The next morning, the maid observes that both beds in the room are mussed. Parkins denies having slept in the other bed and calls its rumpled state a phenomenon. In the short story, there are two events that do not occur in this filmed version. A little boy playing on the lawn outside the inn is frightened by the sight of a draped figure waving at him from the window of Parkins’s room. Also, Parkins and the colonel have a conversation while playing golf about the superstition that one can “whistle up the wind” and Parkins mentions the whistle he’s found. The first isn’t necessary to the plot, but the second does seem to me to be a significant omission. Parkins, at his most coherent and pedantic, picks apart the meanings of the words “believe,” “ghost,” and “survive” rather than answ er the question. He seems smugly pleased with himself about the cleverness of his response all during the day, but there is something waiting for him in his room that night that will knock the smugness right out of him. In this version, we don’t get a good enough look at the sheeted form rising from the bed to see its expression. Nor does it move around the room as much as it does in the written story–I suspect that this kind of special effect was beyond the BBC in the 1960s and to try it might make the creature more funny than frightening. The colonel comes to the rescue before Parkins is in any real danger, but since Parkins never mentioned the whistle I’m not sure how the colonel knew that he would be needed. I suppose he heard Parkins’s shouts, although they really didn’t sound any different to me from the sounds he normally makes when he’s not being confronted with supernatural entities. The final scene ends with the colonel sensibly picking up the discarded sheets from the floor and folding them in the background while Parkins murmurs “No, no…” in stunned disbelief at what he’s just seen. On the same disk is also the 2010 version with the same shortened title, but beyond the basic premise it has little to do with James’s story and is set in contemporary times. John Hurt plays a retired professor who has just left his wife (Gemma Jones) in a nursing home; she is suffering from severe senile dementia and is entirely unresponsive except for the occasional twitching of her hands. He goes back alone to the seaside hotel where they spent their honeymoon many years earlier and while wandering on the beach finds… not a whistle, but a ring. After that, there are some spooky occurrences at night as something lurks in the corridor outside his room and tries to get in. It has its moments. I especially enjoyed the bit where he puts a big, fluffy pillow up against the bottom of the door to try and block whatever’s in the hall outside, and the pillow gets sucked out through the gap beneath the door. But if you suspected early on that this haunting had more to do with the wife than any ancient spirit recreating a body for itself out of bedsheets, then the ending comes as absolutely no surprise.